Last month, my partner Steven headed north to Cape Cod to spend a week soaking up the sunshine with his mom. 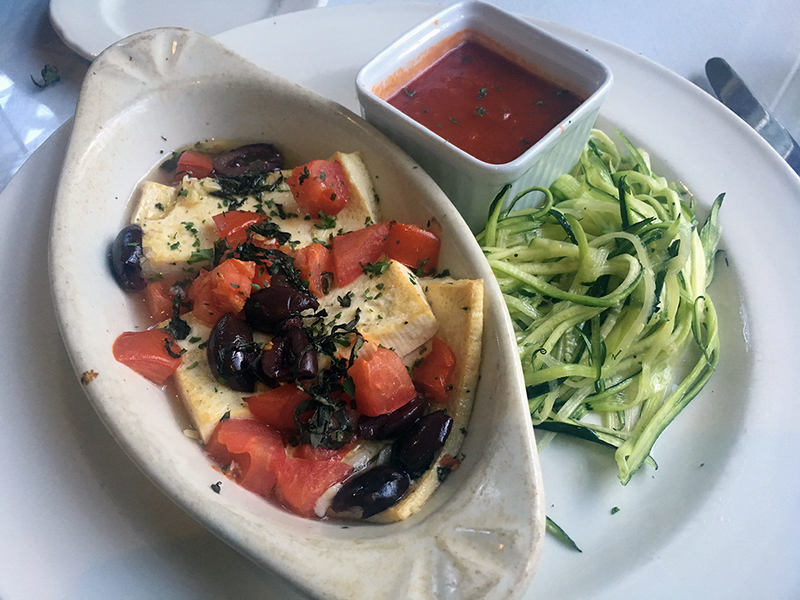 He kept me well-apprised of all the vegan food he found during his stay, and given the plentiful options available for veg-friendly folks, I knew I needed him to write up a review of everything he enjoyed on his trip. 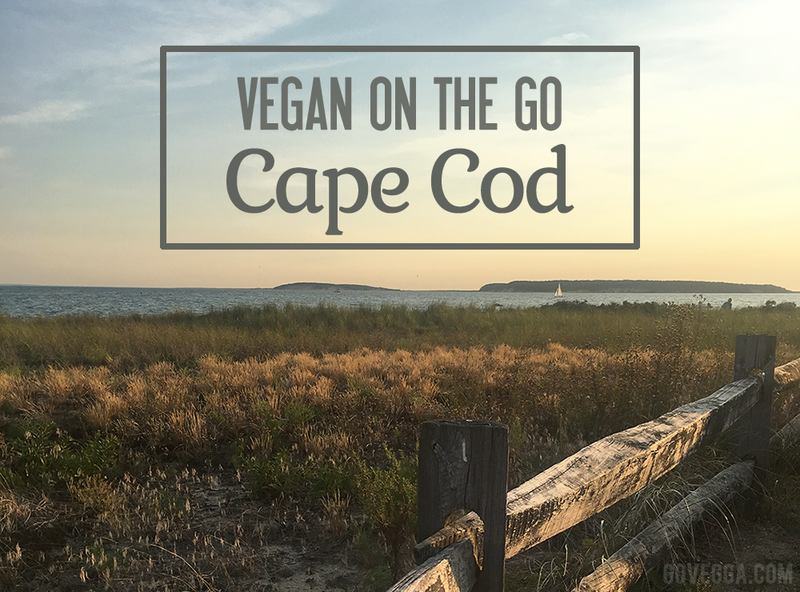 So, here it is: Steven’s report on where you can find vegan food in Cape Cod. All words and photos are Steven’s. Our first stop was Pearl, a classed-up beachside seafood place right near Mayo Beach. 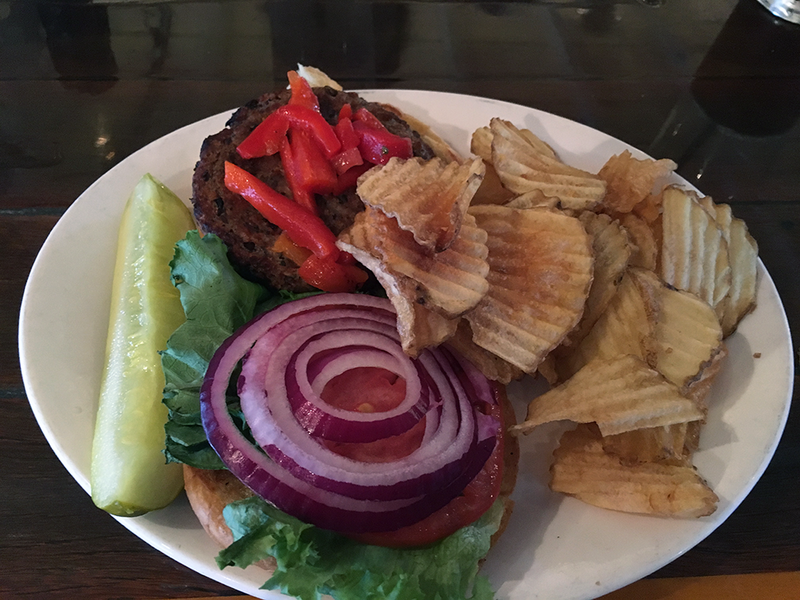 After verifying that the veggie burger was vegan, I ordered it with a side of hand-cut potato chips. The burger itself was nothing to write home about, and I erred in ordering it again on a return trip (even when I added the sriracha slaw). The hand-cut fries, on the other hand, were absolutely fabulous — piping hot, crispy, and nice and thick while still being wonderfully crunchy. Provincetown is probably the most veg-friendly town on the Cape, and my mom and I stopped by JD’s Wood Fired Pizza for lunch during our visit. 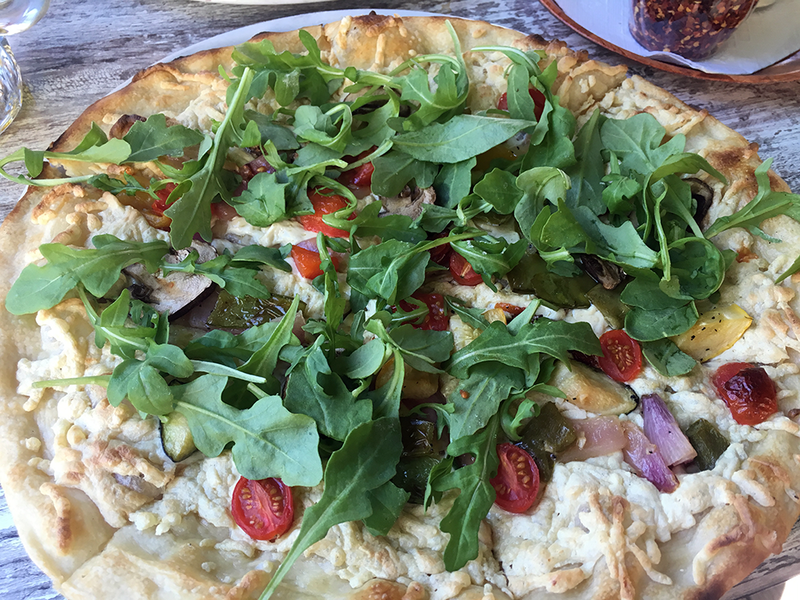 I ordered the primavera pizza, which featured peppers, snow peas, zucchini, onion, summer squash, mushrooms, sundried AND cherry tomatoes, and a big old pile of arugula. I have a bad habit of always ordering Daiya on pizza when it’s available, and this veggie powerhouse definitely didn’t need it. Thankfully the chef had a light hand with it. The crust was crispy and delicious, and while I could have done with some tomato sauce, it was a great pizza. “Vegan Soft Serve” was written on the sandwich board outside this shop, so I had to stop in. 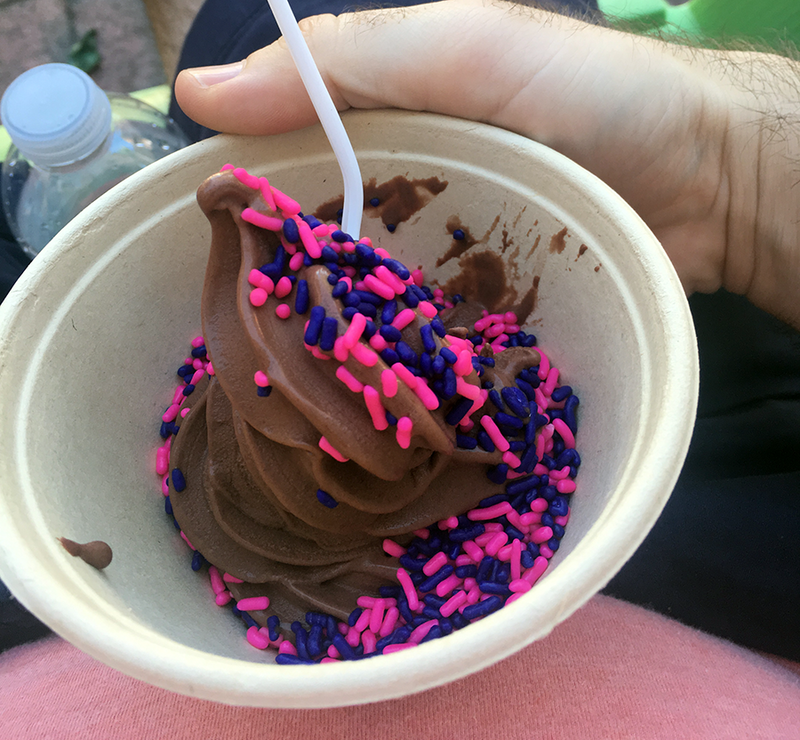 The only flavor was chocolate, and although it was not especially unique, I always appreciate vegan soft serve — and this one came with purple sprinkles! Lunch in Wellfleet was a little tough to find, but I figured the Box Lunch sandwich shop would have something I could eat. 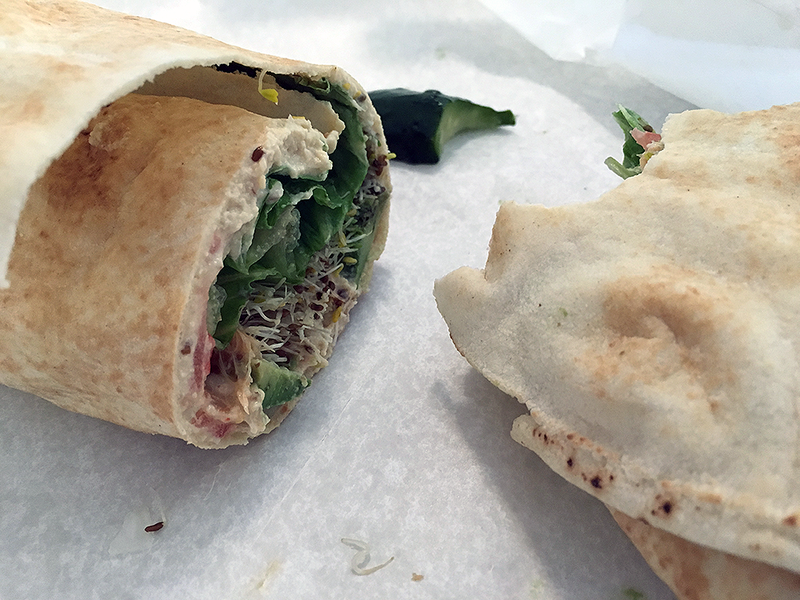 One of the few options was the “Hum Vee,” a pretty standard wrap with hummus, tomatoes, avocado, sprouts, onions, and lettuce. Unfortunately the hummus was overly salty and there wasn’t much (if any) avocado to balance it out. I wondered why I was the youngest person in the restaurant by about 30 years until I realized it was Early Bird dinner hours. Someone has clearly made an effort to be accommodating to vegans at Van Rensselaer‘s, as the restaurant offers an explicitly vegan fried rice bowl and a tofu provencal that can be made vegan. I got the latter along with a trip to the salad bar, which was decent — there was a kale salad that looked very out of place among the rest of the standard salad bar fare. The tofu provencal was unfortunately not as appetizing. There were zoodles for some reason, and the tofu had clearly not been prepared properly (it was limp and bland). I couldn’t resist the vegan peanut butter brownie for dessert, but it was unfortunately just as mediocre. Disappointing, given the prices here! 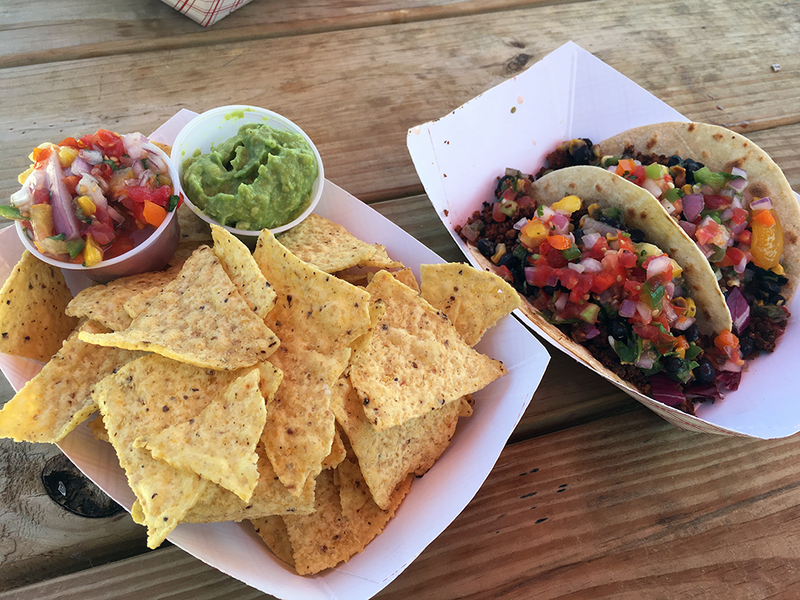 Right off Route 6 is a little convoy of food trucks called Eat at the Fleet that includes Joey’s, a tex-mex truck with some solid veggie options. I got two chorizo tacos and shared some tortilla chips with my mom. The chorizo was quite good and uniquely flavored, if a little overly sweet, and the pico was awesome — the cashier told me it was from a local farm, and it certainly tasted fresh. I always have to get vegan Reubens when they are available. The one at Green Lotus was quite good, even if it wasn’t the best (that honor goes to the Reuben Royale at Liquid Earth in Baltimore). And their vegan clam chowder was awesome. This very veg-friendly South African restaurant in Eastham was absolutely packed on a Saturday night. I started with the West African Peanut Soup, which I often make a quick and lazy version of at home. This one featured pumpkin and carrot in addition to peanut and was absolutely delicious. I also got the Vegan Bunny — apparently “bunny chow” is a South African street food that features curried meat or vegetables inside a loaf of bread. 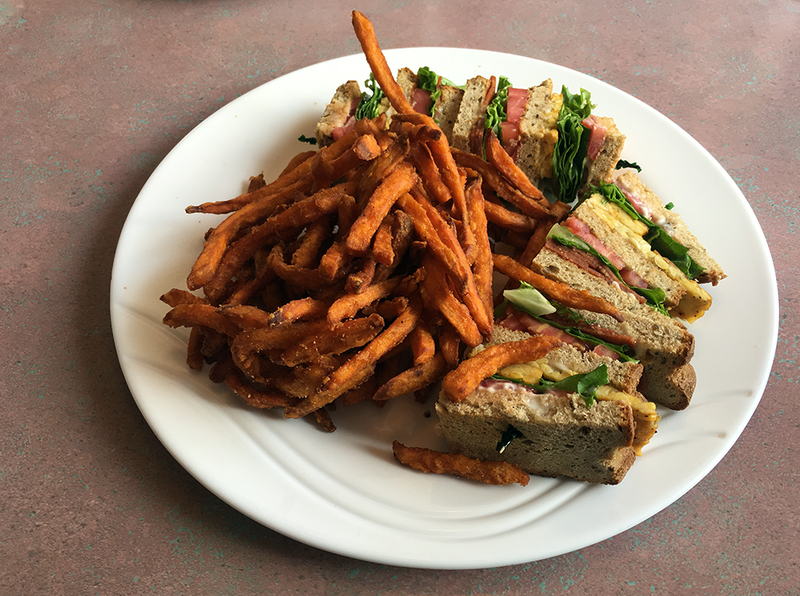 This was more of an open-faced sandwich, with flavorful and savory curried veggies, a pile of delicious sweet potato fries, and two buns in there somewhere. Whenever Kelly and I drive up to Rhode Island to visit her family, we see the sign for Shoreline Diner — but it’s always past midnight and we can never make the time to stop. On this trip I vowed I would make it. On the drive over I deliberated for awhile between a breakfast dish (Berries and Cream French Toast) and something more savory, and in the end decided on the Tempeh BLT Club. Crisp, flavorful, and filling, this sandwich included both tempeh and veggie bacon. I was in protein heaven. There’s apparently a thing in Connecticut called Salad Pizza. 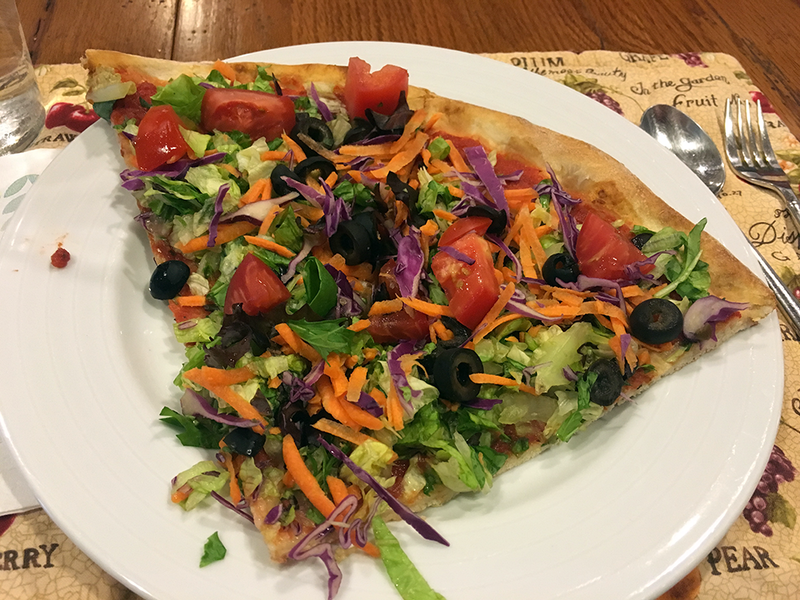 When my cousin told me he was ordering pizza from Michael Angelo, I responded in the classic vegan way — “Don’t worry if the pizza isn’t vegan, I’ve got leftovers, I don’t want you all to have to go out of your way.” Of course, they responded like family should, by calling to check that the pizza was vegan and making a delicious salad, fresh salsa, and guac for sides. Salad pizza is, much like it sounds, is simply a chef salad dumped on top of a pizza. It’s very strange and very good, and never comes with cheese anyway, so I didn’t have to feel bad about depriving them.